Last time I posted I talked about learning curves. Getting a feeding tube comes with a huge learning curve. Between my nasal tube last year and my surgical tube earlier this year, and between hospital nurses, nurse educators, home health nurses, dietitians and my medical supply guy, I was given a lot of information! Yet even with all that information, I still went through two months of nothing but trial and error. And now? Well, I’m still figuring out how to make this work for me and I’m continuously learning what works and what doesn’t work. One thing that no one gave me any information about, however, was wardrobe. Now I know this might seem a little bit futile – I mean after all I have a feeding tube, so clearly I have some bigger issues at hand than my wardrobe – but it is actually a huge adjustment. Part of getting healthier is slowly getting up, out and about, and I don’t want to wear pajamas all day every day anymore. You’ve probably never thought about it because you’ve never had a reason to (I sure hadn’t considered it before all this) but the average wardrobe is not really feeding tube friendly. My tube, especially this new tube, is not at all discreet. Because of the design of it with a balloon holding it in right under my skin, it sticks straight out from my abdomen. I can’t tape it down to hide it without causing discomfort and pain, encouraging granulation tissue, and potentially cutting off circulation to my intestines. There is also the end of the tube that needs to be secured in some way. Tape is out because I would have to remove the tape every two hours to flush the line and my skin would start a revolution. Basically this leaves me to tuck the end of my tube into the waistband of my pants. Speaking of waistbands, any pants that fit snugly around my waist cause a lot of discomfort when I try and move because any pressure on my abdomen shifts the tube around. And oh yeah, the more the tube shifts, the more granulation you get. So, as you can see, this tube can make finding clothes a challenge. Think about what you are wearing right now, or what you wore yesterday, or what you plan to wear tomorrow – is it tube friendly? Would your shirt lie nice and flat? Would your pants still be comfortable? Could you tuck your shirt in without looking like you have some strange growth? Would you be able to easily access your tube to flush it? I’m not saying this to get sympathy. I’m just trying to explain the thoughts that ran through my head when I got this tube, opened up my closet, and realized I had nothing to wear. At first I was beyond frustrated. It wasn’t just that I had nothing to wear, it was that this tube had changed so many things about my ‘normal’ and I was already making so many adjustments, I just wanted one thing to be easy. As I thought about it, though, I realized I had two options. I could sulk about how I had nothing to wear and stick to sweats and Lululemon pants all the time but that didn’t sound very productive. My other option was to accept that this was just another thing I had to adjust to and find a way to make it work. Well find a way I did and here is my secret: I wear maternity jeans. The jeans with the giant elastic panel? Yup, those ones, those are the ones I’m talking about. In fact, the pants in that picture right there with that navy blue waist? Those are them! 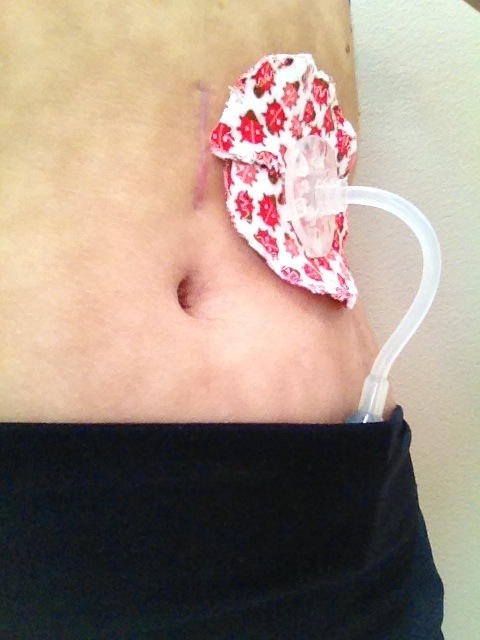 And here’s the thing – they fit great, they are incredibly comfortable, and they perfectly accommodate my tube. Am I crazy about the fact that I’m only 22, not at all pregnant, and wearing maternity jeans? No, no I’m not. Did I feel a pang of sadness when the mother-to-be in front of me at checkout turned around and shared with me how she hasn’t been able to fit into any of her clothes lately and is happy to have some new options? Yes, yes I did. Her clothes don’t fit because she’s actually pregnant, because she’s preparing to welcome a new baby into her family. My clothes don’t fit because I have a chronic illness that required me to get a feeding tube. It’s not exactly the same thing. In the end, though, I’m not sad. In the end, I embrace it! I am taking a not-so-fun reality and making it work for me. I’m not giving up. I realize that there is nothing I can do right now to change the fact that I need this tube, so I am accepting it and moving on with my life. And I’m proud of that. When we give in, we allow ourselves to accept. And when we accept, we allow ourselves to embrace. And when we embrace, we allow ourselves to celebrate. We could dwell on the realities that we don’t like, or we could embrace the possibilities out there and move on, rise above, create new solutions and become better people for it. And that is something to celebrate. I don’t know about you, but celebrating sounds like a lot more fun to me! No matter how many of your posts I read, I am always in awe of your ability to express yourself, most often with humour. In spite of all your struggles, pain and worries, you always maintain a positive outlook! You are such an inspiration to me, and I am sure to so many others! Keep on looking at the bright side. One day, that bright side will be yours to keep!